Also known as FAEE, its beginning is can be traced from the father of Young Tissue Extract (YTE), Dr. Bjodne Eskeland. He is a Norwegian egg research scientist who dedicated his life to harnessing the peptides found from a partially incubated and nine days old egg. Interestingly, the peptides from the Proto Embryonic Stage of the egg (PESE) are full chains of amino acids, making egg the gold standard of nutrition. Thus, this protein-type is a good source of maintaining healthy cells, particularly muscle tissues and bones. Laminine combined other organic proteins ingredients from plants and sea to create the perfect combination of peptides needed to repair, restore, and regenerate damaged or aging tissue cells. The egg extract FAEE contains Fibroblast Growth Factor (FGF). This substance is only available on the ninth day of incubation. It must immediately be harvested. 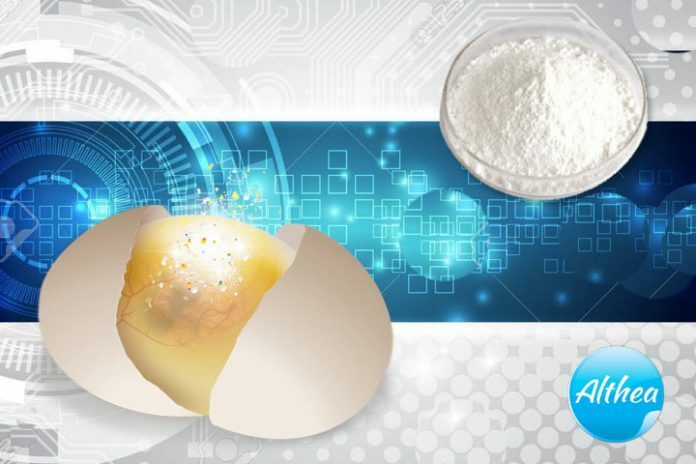 The process to preserve purity makes Laminine’s egg powder extremely potent because of how the substance is harvested from the albumin of the egg. Eskeland together with LifePharm scientists uses an evaporative cooling method that preserves the peptide. Combined with two other ingredients, Laminine forms the perfect supplement that helps the body reach homeostasis. You can read here the full review on Laminine. FGF is important because it boosts the development of the embryo in leaps. When ingested by humans, FGF works as a signaling protein molecule that tells the body to maintain and repair damaged or aging cells as needed by directing stem cells in the body. These peptides appropriate itself based on what the signaling protein (FGF) is directing it to do. The bioactive peptides in Laminine stimulate the dormant stem cells to utilize the phyto amino acids and marine protein to repair damaged aged cells. Bioactive peptides are responsible for building the linings in the blood vessels, creating the infrastructure for the nutrients to flow to critical areas of the brain and organs. Research credits bioactive peptides with the potential to directly affect many neuro disorders because of clear results of the ability of bioactive peptides to affect the growth of neurites (4). Neurites are signal senders (Axons) and signal receivers (dendrites) attached to the brain neurons. Research has also shown clearly that new cell cultures show a dramatic increase in peptide and amino acid uptake in the presence of FGF. This result gives credence to the hypothesis that embryonic growth is influenced by a very precise mechanism, which combines unique combinations of amino acids, peptides, and FGF. All LPGN products manufactured at its facilities are NSF and cGMP certified, featured at the American Health Journal, and accredited at the Physician’s Desk Reference.